If you love playing Scattergories, Scattergories Categories may be your new favorite game. Though the two games are essentially different, the idea of coming up with words that start with a specific letter and fit a variety of themes applies to both. 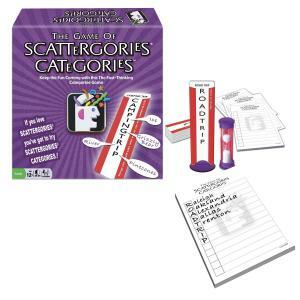 As you play Scattergories Categories your word skills and general knowledge will be put to the test, but with this version of the game you'll be focusing on specific categories. To play traditional Scattergories, you roll the letter die, then use that letter to come up with words to fit the 12 categories on the list card. You have three minutes per round and earn points when you write down words that are not duplicated by anyone else. A word that uses the letter once scores one point. A word that uses the letter twice (such as Green Grape) gets two points. Like in Scattergories, each word you come up with that is not duplicated earns a point. Unlike the original Scattergories, you do not earn extra points for words like "Entrance Exams" that use the letter twice. While Scattergories Categories offers 250 different categories, if you play a lot you will burn through them quickly. 250 categories equals 250 rounds and at 2 minutes a round, that's only 8 hours of play. If you enjoy the game you will be playing much more often. Use some of these categories to increase the amount of time you can enjoy the game. You can also customize the game by adding categories that are a little more personal. Use the name of a favorite college or sports team as a category. Play a game where each category represents the name of a family member. Include categories representing places you have been on vacation or books you have read. The more personal the categories, the more fun they will be. Scattergories may have been your go-to game for a party or family fun night, but pick up a copy of Scattergories Categories and give it a try. The rounds are shorter than a traditional game of Scattergories and your friends and family members will have fun dominating the categories they know well. The game is familiar enough so players will be comfortable with it right away, but different enough to provide a fresh take on a favorite. It may become your next game night hit.